We’d love your help. Let us know what’s wrong with this preview of The Last Myon by Rudi Jennings. 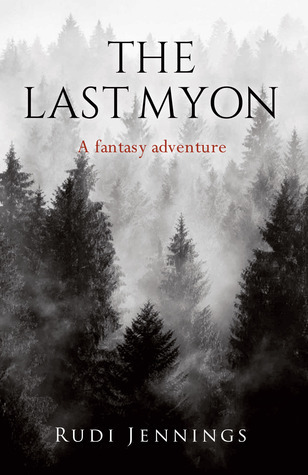 "The Last Myon" is a story of fantasy adventure, revenge and an individual's total unwillingness to submit or to fail, battling against overwhelming natural elements and a group of hardened, sadistic creatures who will stop at nothing to succeed in his capture and slavery. In an everlasting winter world, Ackrehm, the last of his Myon kind, must fight for his life, sustainin "The Last Myon" is a story of fantasy adventure, revenge and an individual's total unwillingness to submit or to fail, battling against overwhelming natural elements and a group of hardened, sadistic creatures who will stop at nothing to succeed in his capture and slavery. To ask other readers questions about The Last Myon, please sign up. I really enjoyed how the story was fast moving, it kept going from the very beginning, there was action, and it didn’t stop. The story first follows the Myon and the Geflacks. Ackrehm(myon) took the leader Kadamlic by surprise and injured him after the Geflacks killed his horse Therd. Kadamlic who was King wanted to seek revenge on Myon. He sent two of his soldiers Raith and Cleave to bring the Myon back to him alive. The writing style was really good, and the way the characters were described really allowed you to envision what the characters looked like. I like the various creatures that were involved in the book, the myon, Geflack Cyclops, the elf woman( who was my favorite), a dwarf and a banshee. The end took me by surprise and I can’t wait to find out what happens next. Possibly find out why Ackrehm may be the last Myon….? What a fantastic read! Mr Jennings has a way of telling a story that keeps the reader on the edge of every page. This book took me from the real world and placed me into the world created by this gifted writer...and that is the mark of a brilliant author! Can't wait for book two! Lord Richard J Carberry, author of "A Fistful Of Fur"! Rudi is a new author to me. I found out about him at a signing in October in Peterborough. This signing also gave me the opportunity to meet Rudi and chat with him. I also purchased a signed paperback of The Last Myon to read. The Last Myon is a fantasy novel that includes Elves, Dwarfs, Humans and A Myon. It is told from multiple points of view but it’s clear who’s POV by the name of the characters. I liked the multiple POVs as it allowed me to see more than one side of the story it’s almost lik Rudi is a new author to me. I found out about him at a signing in October in Peterborough. This signing also gave me the opportunity to meet Rudi and chat with him. I also purchased a signed paperback of The Last Myon to read. The Last Myon is a fantasy novel that includes Elves, Dwarfs, Humans and A Myon. It is told from multiple points of view but it’s clear who’s POV by the name of the characters. I liked the multiple POVs as it allowed me to see more than one side of the story it’s almost like reading more than one story at the same time. The characters that are in this novel are well thought out and they play their roles well. Each one brings a different skill set to the overall dynamic of the story. I’m really glad I had a chance to read The Last Myon and I’m looking forward to seeing what Rudi comes up with next. Overall a really good read with promise for the author. There are however some spelling and punctuation errors that could have been worked out before printing.